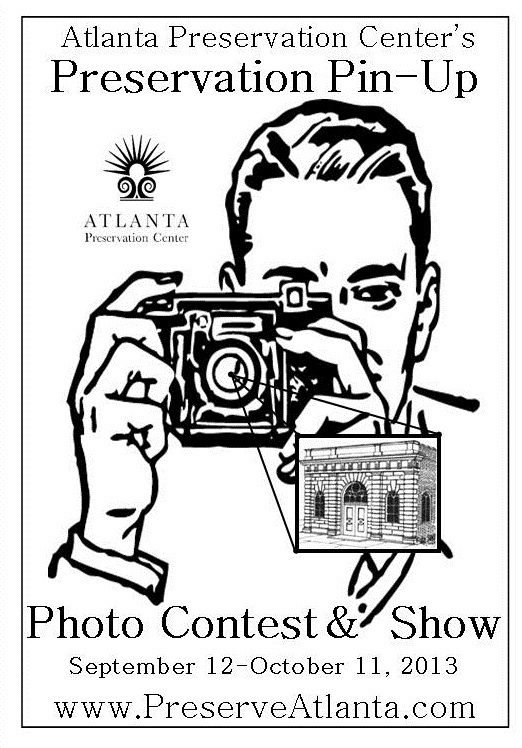 Preservation Pin-Up: Contest & Show is a juried exhibition of lens-based work by members of the Atlanta Preservation Center. Fifty works of historic sites in the City of Atlanta will be exhibited at the LP Grant Mansion’s Drawing Room Gallery from September 12 – October 11, 2013. This event is sponsored by Artifacts, Inc, picture framing. Selected works will express the beauty and importance of one or more of Atlanta’s historic buildings, landscapes or neighborhoods. • Applicants must be current Atlanta Preservation Center members. If you are not a current member, information is available here. • The subject of submitted images must have been built or developed before 1965 and be within the city limits of Atlanta. Amy Miller, Executive Director of Atlanta Celebrates Photography, will jury the exhibition. Ms. Miller earned her MFA in photography from Pratt Institute and was Gallery Assistant at Alan Klotz Gallery in New York City before becoming Gallery Director at Fay Gold Gallery in Atlanta, a position she held for almost eight years before joining the ACP. In the last five years, Ms. Miller has participated in numerous national portfolio review events, curated exhibitions internationally, juried shows and judged competitions including Critical Mass, a nation-wide photography competition. Each applicant may submit up to three images for consideration. Submissions should be made electronically. If this is not possible, special arrangements can be made by calling Carolyn Stine McLaughlin at 404-688-3353 ext. 11. Body of email should include: Applicant name, mailing address and phone number. For each submitted image list the title, common name of site if applicable, address (include quadrant and zip code) and year of construction or development. "Agnes on the Front Porch"
Email submissions to: Carolyn Stine McLaughlin at Carolyn@PreserveAtlanta.com. The APC is no longer accepting submissions. Notifications will be made by August 28, 2013 at which time the applicants of accepted images will be asked to submit a print of the image for exhibition. Prints will be displayed unframed and the print will be pinned to the display. Prints must be delivered to the Atlanta Preservation Center by Friday, September 6, 2013 at 12:00 pm. The APC retains the right to request that an image be reprinted and may refuse to display a submitted print. APC will make every effort to manage the safety of accepted prints. APC is unable to accept any liability for damages from any cause for the duration of the project and exhibition. Prizes will be awarded for first, second and third places. Images will appear on the APC website, social media and in the Preservation Times, APC’s printed newsletter. Exhibited prints will not be sold during the exhibition. Purchase inquires will be directed to the applicant. The APC retains usage of the images during the project period for promotion and documentation. All printing and reproduction rights remain with the applicant.